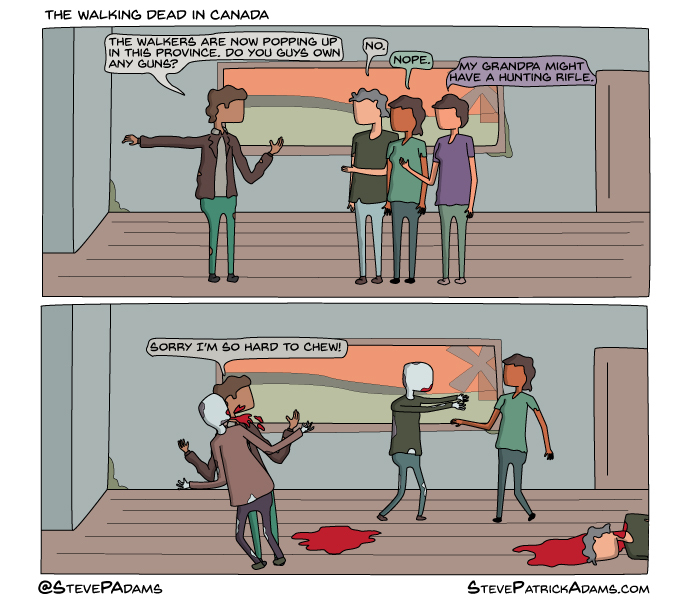 The Walking Dead would not quite be the same if the story took place in Canada. But what about when they thaw out? Perhaps we should all go to Nunavut. Ah yes the mythical “thaw out” I have heard of this event. But I don’t believe the tales. We do have guns in Canada. Yes, but there are far less than in the United States (about a third the amount of guns per capita). The comic doesn’t suggest there are no guns. a fictional fear (zombies) being used to promote a fictional sense of safety (gun ownership. Most suicides by gun, and most accidental deaths by gun occur at home.